Whether you are moving into your first home, a new place, or are choosing to remodel, furnishing the living room is something that should not be overlooked. The living room is a place to relax, unwind, watch some television, and spend quality time with family and friends. Not only do you want to ensure that you have enough seating to accommodate guests, you want to make sure you have the right pieces to the aesthetics of the room. Let’s take a look at five essential pieces of furniture needed to make your living room look great and well-rounded. If you plan to use your living room as an area to host guests, there’s not a piece of furniture better than a sectional couch or sofa. Whether having family or friends over, you will need enough seating, and one of the most comfortable ways to sit multiple people is by having a couch that extends the length of a room. Look for Try different types of colors and fabric combinations to find the sectional sofa that best fits your style. A coffee table, as indicated in its name, is a table placed in the living room’s center and its main purpose is to serve various refreshments and other food items to the guests whom you entertain at your home. No, these tables are not only for serving coffee. In fact, coffee tables have multiple functions. Adding a coffee table between the television and the couch or chairs in front of it can make your living room feel complete. Loveseats, although they can typically only accommodate two people, offer a comfortable place to sit in a living room space. And, being comfortable in your living room is the best way to make it feel like your home. Depending on how much space you have and how much seating you need, you can choose between a loveseat, a couch, or a sectional. People will need a place to set their beverages down other than the coffee table, and having end tables or side tables are strategically placed throughout the living room is a good way to ensure there is enough space for people to set their drinks. Additionally, plants, lamps, and other decor can be placed on these tables for added aesthetics. Accent chairs, or side chairs, can bring balance to a living room space. If you have space that is empty and being completely unutilized, an accent chair will complete the area. An accent chair is just an extra place to sit to some, but for those who care about aesthetics, it’s the perfect way to balance shifting focal points in the room. Adding these five pieces will certainly help round out your living room space. However, often times these furniture pieces come with a high price tag at retail furniture stores. However, at a consignment furniture store, you can find quality pieces at an affordable price. If you are looking for furniture consignment stores in Clearwater and St. Petersburg, stop by Consignment Furniture Showroom & Gallery. 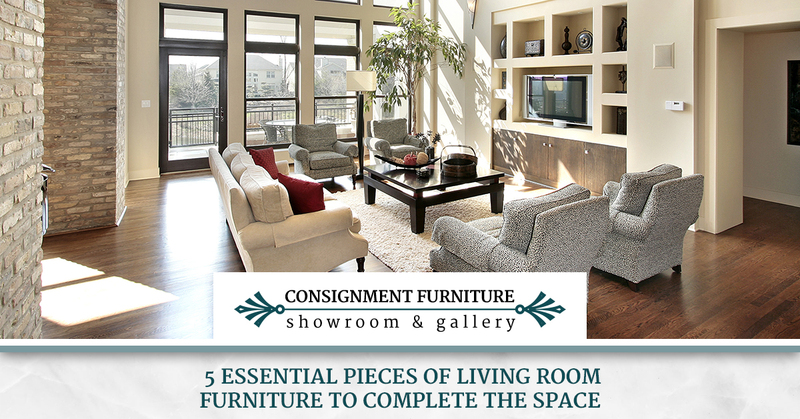 You’ll be sure to find the essential pieces you need to add to your living room.